At Waukeela, we eat all of our meals together in a lively dining hall experience! It is important to us that we provide the best food possible to keep our campers active and healthy. Our camp chef makes some of the most fantastic fresh salads, pastas and main courses you could imagine! There are choices at every meal for campers who may not enjoy the main dish, including salad, fresh fruit, plain pasta and more! Our chefs can cater to almost any special diet and we are 100% nut free. We can also accommodate gluten-free and vegetarian diets. 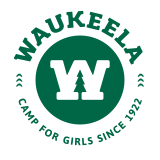 There is so much variety at Waukeela that our campers never get tired of the food! Whether we are having wraps and fresh fruit or an old fashioned BBQ, our campers can always enjoy something they think is delicious. We always use high-quality ingredients and cook everything locally to ensure the healthiest food for all of our campers.